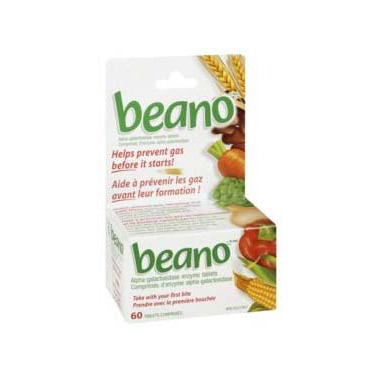 -Use for the right problem: Use Beano if you experience the symptoms of stomach gas caused by many healthful foods. Use it right before every meal with problem food. Other Ingredients: Cellulose gel, mannitol, invertase, potato starch, magnesium stearate, colloidal silica, gelatin. If a rare sensitivity occurs after taking Beano Tablets, discontinue use. Galactosemics consult your doctor. Store below 25°C (77°F). Avoid Heat. Too much heat can inactivate the enzyme, so don't cook with Beano. First time trying such a product. Easy to take and effective. What I like is there is no aftertaste or residue. Did what it was desgined to do. I will add it to my future list of good choice products.